Arancini quickly became a favourite of mine. 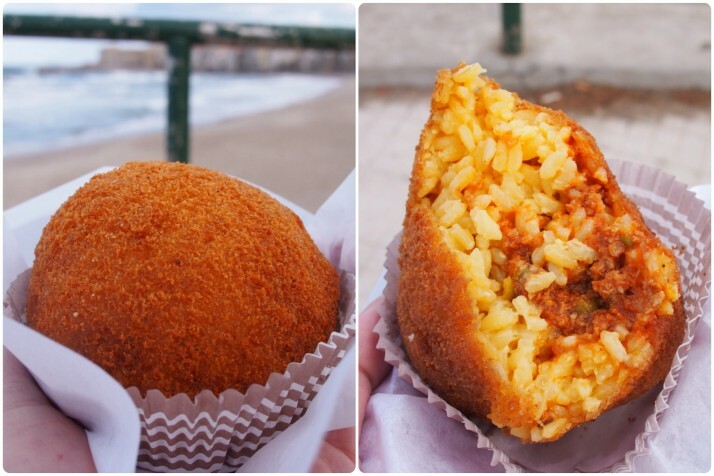 It’s a ball of cooked flavoured rice, a bit like a plain risotto, containing a filling plus a lump of cheese, then covered in breadcrumbs and deep fried. Fillings include mince and peas, mushrooms, or ham and cheese and generally the different flavours are different shapes (sphere, cone, cylinder) so that the shopkeeper can tell them apart. Best eaten warm while the cheese is soft and oozing. 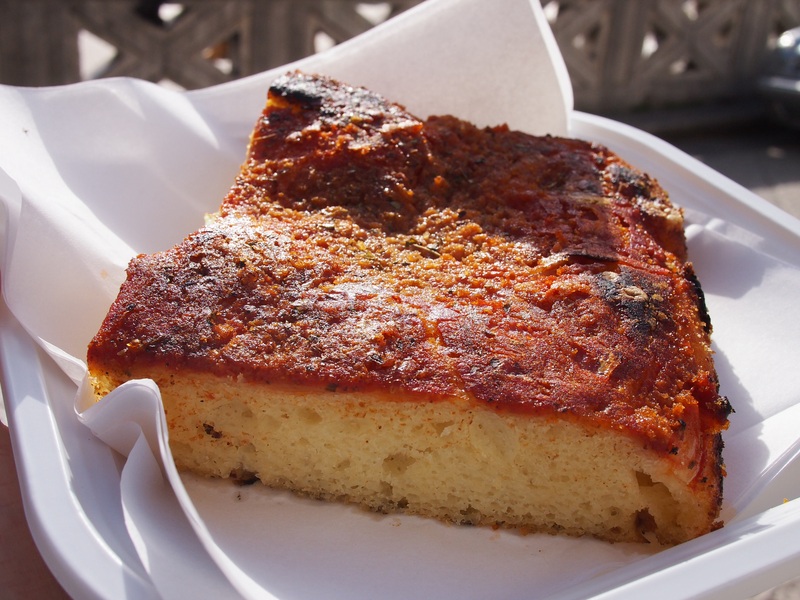 Everyone knows about pizza and sfincione is a Sicilian version. The base is thicker than a normal pizza and more spongy, slightly reminiscent of a crumpet. The traditional topping is a mix of tomatoes, onions, and anchovies, and dotted with a little caciocavallo cheese which is stronger than the usual mozzarella. 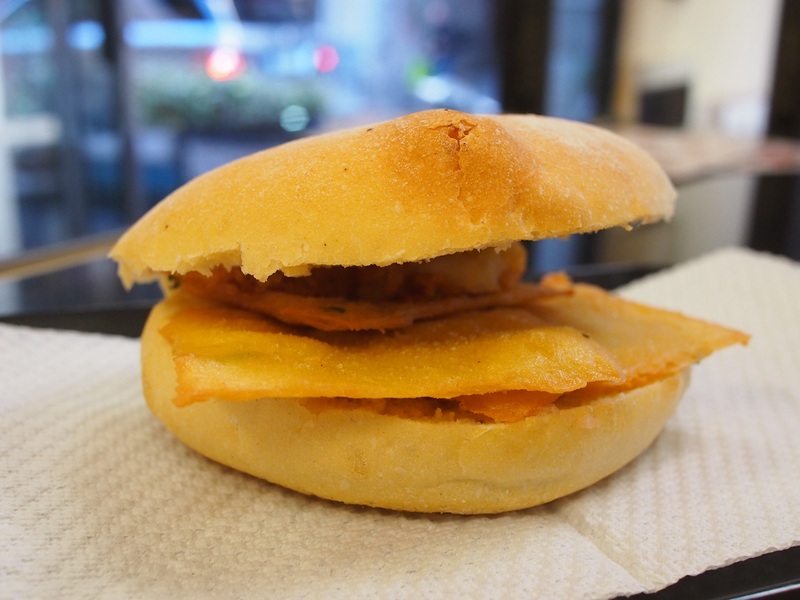 Thin pieces of dough made from chickpea flour, deep fried until crispy and served in a crispy bread bun with salt and lemon juice. Pleasingly similar to a chip butty. Along the same theme are sandwiches containing crocchè, deep fried balls of mashed potato flavoured with herbs. Or if you can’t decide you can get them in the same bun. 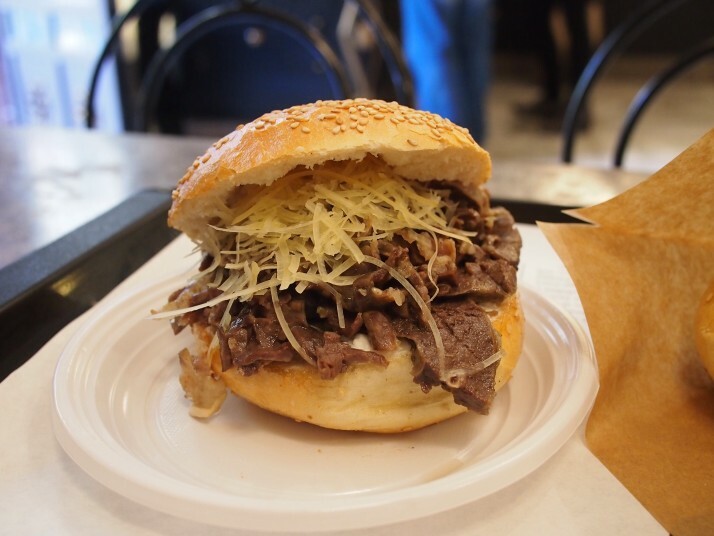 This is veal spleen, cooked in a big pot and served in a bread bun with grated cheese. Andrew had a bite but wasn’t keen. I thought it tasted fine but not as good as the smell from the vats of cooking meat wafting down the street. I’d always thought that spleen was a mixture of different offal but actually it’s a distinct organ. Gelato is common across Italy, the Palermo twist is serving it in a brioche bun. We didn’t try it as most of the gelaterias are closed in the winter and it was a bit cold for us to go hunting for it. Cannoli are a distinctly Sicilian dessert. It’s a fried pastry tube filled with sweetened ricotta and decorated with glacé cherries or candied peel. 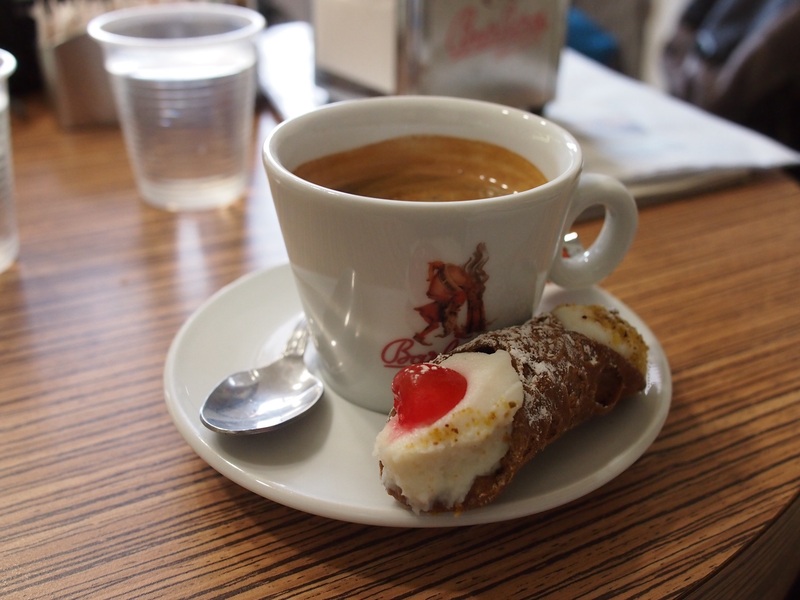 You might recall that in the final scenes of The Godfather: Part III a cannolo was used as an assassination tool which always made us a little nervous as we took the first bite! And to wash it all down? Well either a very short sharp kick in the ribs from an Italian espresso, or if that’s not for you then allow me to present the Spritz. It’s a drink we first got a taste for several years ago in Venice with our friend Heidi. It’s made from Aperol, an orange based bitter liquor, mixed with prosecco and soda and served over lots of ice with a fat slice of orange. Not strictly street food but we do recommend drinking it in a pavement cafe so you’re outside at least! Dangerously refreshing. 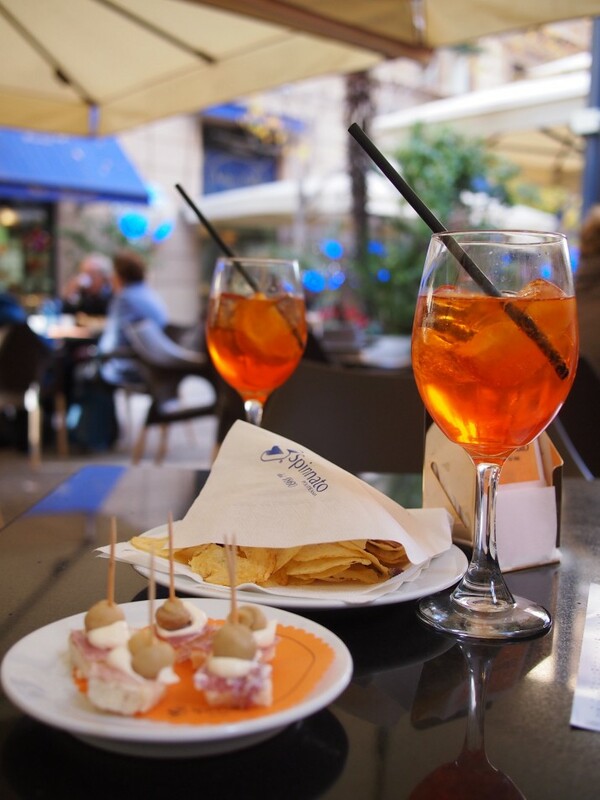 This entry was posted in Experiences and tagged Food, Italy, Palermo, Sicily on January 17, 2015 by Julie. I’m glad I tried it – it’s definitely one of those foods where the thought of it is worse than the actuality. Same for me on the spleen! But probably also quite healthy for you…. I would say ok though after a spritz or two!! !